Just wanted to announce that the new version of “Mastering CSS with Dreamweaver CS4” has been released and is available in your local bookstores, as well as online. And this is not just a simple update to change screenshots. 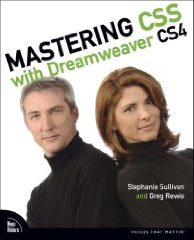 Due to the fact that Dreamweaver CS4 is so radically different from previous versions and the fact that several of these new features mean that the our web workflow actually changes (for the better), Stephanie Sullivan and I have gone over the book page-by-page. In addition to a new chapter that covers just what is new in Dreamweaver CS4, we have completely rewritten over 60% of the book. We’ve also responded to reader’s requests and enhanced the supporting files, providing incremental files, so that you can easily pick up at any point – or compare your version to ours as you work through the exercises. I swore I would never buy another CSS book, but then I saw this one in my local Borders. How could I not buy it?